Amateur boxing (sometimes called Olympic boxing) is a variant of boxing practised at the collegiate level, at the Olympic Games, Pan American Games and Commonwealth Games, as well as many associations. Amateur boxing bouts are short in duration, comprising three rounds of three minutes in men, and four rounds of two minutes in women, each with a one-minute interval between rounds. Men's senior bouts changed in format from four two-minute rounds to three three-minute rounds on January 1, 2009. This type of competition prizes point-scoring blows, based on number of clean punches landed, rather than physical power. Also, this short format allows tournaments to feature several bouts over several days, unlike professional boxing, where fighters rest several months between bouts. A referee monitors the fight to ensure that competitors use only legal blows (a belt worn over the torso represents the lower limit of punches – any boxer repeatedly landing "low blows" is disqualified). Referees also ensure that the boxers do not use holding tactics to prevent the opponent from punching (if this occurs, the referee separates the opponents and orders them to continue boxing. Repeated holding can result in a boxer being penalized, or ultimately, disqualified). Referees will stop the bout if a boxer is seriously injured, or if one boxer is significantly dominating the other. Bouts which end this way may be noted as "RSC" (referee stops contest), RSCI (referee stops contest due to injury), RSCH (hard blows to the head), or KO (boxer out for ten seconds). Amateur boxing emerged as a sport during the mid-to-late 19th century, partly as a result of the moral controversies surrounding professional prize-fighting. Originally lampooned as an effort by upper and middle-class gentlemen to co-opt a traditionally working class sport, the safer, "scientific" style of boxing found favor in schools, universities and in the armed forces, although the champions still usually came from among the urban poor. The Queensberry Amateur Championships continued from 1867 to 1885, and so, unlike their professional counterparts, amateur boxers did not deviate from using gloves once the Queensberry Rules had been published. In England, the Amateur Boxing Association (A.B.A.) was formed in 1880 when twelve clubs affiliated. It held its first championships the following year. Four weight classes were contested: Featherweight (9 stone), Lightweight (10 stone), Middleweight (11 stone, 4 pounds) and Heavyweight (no limit). (A stone is equal to 14 pounds.) By 1902, American boxers were contesting the titles in the A.B.A. Championships, which, therefore, took on an international complexion. By 1924, the A.B.A. had 105 clubs in affiliation. Boxing first appeared at the Olympic Games in 1904 and, apart from the Games of 1912, has always been part of them. From 1904 to 2016, the United States and Cuba won the most gold medals; 50 for the U.S. (114 overall) and 21 (73 overall) for Cuba. Internationally, amateur boxing spread steadily throughout the first half of the 20th century, but when the first international body, the Fédération Internationale de Boxe Olympique (International Olympic Boxing Federation) was formed in Paris in 1920, there were only five member nations. In 1946, however, when the International Amateur Boxing Association (A.I.B.A.) was formed in London, twenty-four nations from five continents were represented, and the A.I.B.A. has continued to be the official world federation of amateur boxing ever since. The first World Amateur Boxing Championships were staged in 1974. A child boxing exhibition in Union City, New Jersey. Computer scoring was introduced to the Olympics in 1992. Each of the five judges had a keypad with a red and a blue button. The judges pressed a button for which ever corner they felt landed a scoring blow. Three out of the five judges had to press the button for the same boxer within a one-second window in order for the point to score. A legal scoring blow was that which is landed cleanly with the knuckle surface of the glove, within the scoring area from the middle of the head, down the sides and between the hips through the belly button. The AIBA introduced a new scoring system in January 2011. Each judge gives an individual score for each boxer. The score given to each boxer would be taken from 3 out of 5 judges either by similar score or trimmed mean. Scores are no longer tracked in real time and are instead given at the end of each round. In March 13, 2013, the computer scoring system was abandoned, with amateur boxing instead using the ten point must system, similar to professional boxing. In June 2016, professional boxers were admitted in the Olympic Games and other tournaments sanctioned by the AIBA. This was done in part to level the playing field and give all of the athletes the same opportunities government-sponsored boxers from socialist countries and post-Soviet republics have. However, professional organizations strongly opposed that decision. A Marine corporal active in USA Boxing (2005). 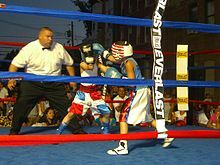 There are several different amateur sanctioning bodies in the United States, including the Golden Gloves Association of America and USA Boxing. The Golden Gloves is an amateur boxing tournament that is fought at both the national level and the regional level. Although the Golden Gloves typically refers to the National Golden Gloves, it can also refer to the Intercity Golden Gloves, the Chicago Golden Gloves, the New York Golden Gloves, and other regional Golden Gloves tournaments. The winners of the regional tournaments fight in a national competition annually. Since 1969, amateur boxing in Canada has been regulated by the Canadian Amateur Boxing Association (Boxing Canada) and the various member provincial associations. Some of the main tournaments include Provincial Championships, Golden Gloves, Silver Gloves, Emerald Gloves and Buckskin Gloves. ^ Josh Rosenblatt. "(Male) Olympic Boxers Will No Longer Wear Ridiculous and Dangerous Headgear". VICE Sports. ^ “Rules Clarifications.” Team USA, www.teamusa.org/USA-Boxing/Rulebook/New-Rules-Clarification. ^ a b "Boxing BC Association". Boxing BC Association.